Nominal 76er Andrew Bynum basically confirmed what Philly fans had feared, and what most everyone else had expected: he will likely sit out the rest of the season, after running into yet another setback with his knees. Bynum spoke up this afternoon, about 10 days after saying he was "100 percent" sure he'd play this year. That tune has changed. "It's getting late. I don't know." When asked about the notion that he doesn't want to play through pain, Bynum didn't disagree. "That's true, I don't want to play in pain," the Sixers center said. "I'm 25. It's my life." This comes as no surprise to the generally beleaguered Doug Collins, who has said multiple times that he has to coach like he'll never get Bynum back. Even when Bynum did practice last week, Collins said "he looked like a guy who hadn't played in nine months." The Sixers gave up a lot to get Bynum—Andre Iguodala, Nikola Vucevic, Moe Harkless and a first rounder—and it was a calculated risk. They knew he could end up being a one-year rental. But his knees were generally thought to be healthy, and he seemed like a more likely candidate to build a team around than Iguodala, who had probably hit his ceiling in Philadelphia. The knee issues popped up almost immediately, and Bynum was variously diagnosed with weak cartilage and slow-healing bone bruises. There is no reason for Bynum to play this season, Philly being more-or-less out of the race with 26 games left to play. When Bynum hits free agency this summer, some team will pay him, though probably at an injury discount price. It's hard to see the Sixers making a strong push to re-sign Bynum (unless he'll take a one-year deal), and it's hard to blame them. He's a 25-year-old big man with two bad knees. Basketball history is littered with cautionary tales that started just like this. A note on the photo above. 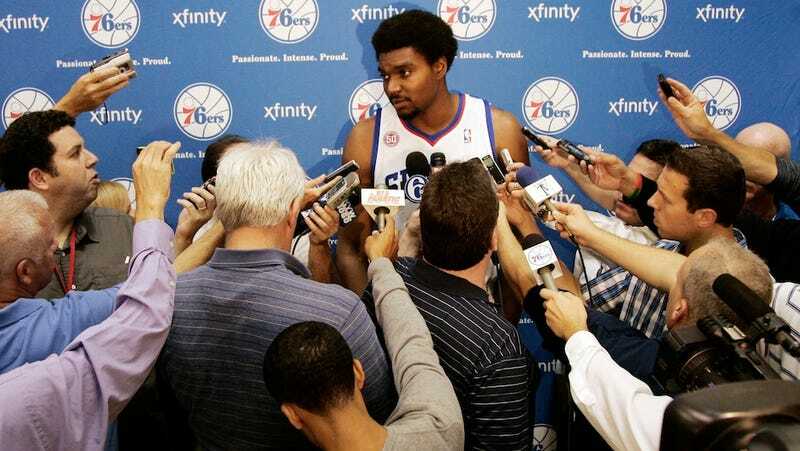 It's an AP photo from media day back in October, many Bynum hairstyles ago. We subscribe to two different photo wire services, and it was the only photo on either one all season that has Bynum actually wearing a Sixers jersey.